Kids are told, "it's for the best," and one day it may be. But right now, divorce is the worst. 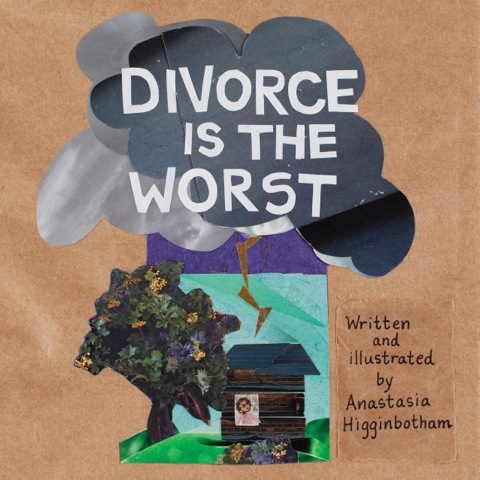 Divorce Is The Worst is a new children's book by illustrator and author Anastasia Higginbotham. By using illustrations, storytelling, and activities, the author empowers children to understand that divorce is not their fault. Described as the first book about divorce that lets kids have their say, Divorce Is The Worst supports children in how they actually feel. The book does not try to make kids feel better about everything. Rather it identifies with how children really experience their parents' divorce. It reassures kids that it is OK to be honest about their feelings. It lets them know that they don't have to pretend they understand this is for the best. The story covers the myriad of feelings that kids go through. Confusion. Betrayal. Fear. Heartbreak. Anger. Guilt. And gives wonderful advice such as "If you feel all of these ways at once, lie down". In the author's words: "Divorce Is the Worst makes space for kids to discover and connect with honest feelings they have about what's happening or already happened. Whether or not they choose to share any of those feelings with their parents or anyone else depends on the child. The point is not for kids to perform their feelings for us but to tune in and find meaning in it for themselves. Our job is to clear the way for them to identify and engage adult allies (family, teachers, counsellors, friends) as they navigate the ordinary terrible events that are a part of every life. Afterward, they get to know they did that." Aimed at 4-8 year olds, it is written in an accessible and authentic way. The tone is matter-of-fact and logical which will resonate well with this age group. I love the collaged artwork. There's a mix of illustrations, brown paper, torn photographs and scraps of fabric. This design reflects how children in this age group produce art and tell stories. The activities section at the end of the book is fantastic. Children are encouraged to use similar art supplies to tell their own story. "Tell it, kid! And live it: brave and true." There are lots of ideas to help children create their own scenes. This gives them the opportunity to work through their feelings by telling their story. This book is truly written from the child's perspective. Its approach is completely child-centric and age-appropriate. I think this is a wonderful and authentic story. It does a great job of recognizing how children really feel about divorce. The reader is also presented with lots of helpful ideas for processing difficult emotions. This is a great resource for families facing divorce or separation.